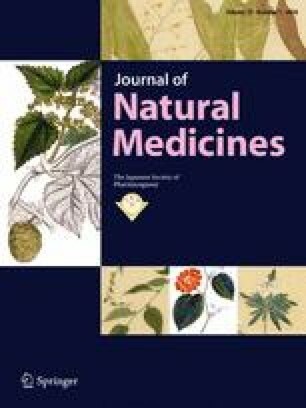 This study evaluated methanol extracts from the leaves and branches of the Thai medicinal plant Diospyros mollis (Ebenaceae). Seven triterpenes and 22 aromatic compounds, including five new compounds, were isolated, and their structures were determined. The new compounds had the following structures: diospyrol glycoside (makluoside A, 1), 8,8′-di-O-6-β-d-apiofuranosyl-β-d-glucopyranosyl-6,6′-dimethyl-2,3′-binaphthalene-1-ol-1′,4′- dione (makluoside B, 2), and 3-methyl-1,8- naphthalenediol glycosides (makluosides C-E, 3–5). Makluoside B is the first example of a naphthoquinone glycoside that has both a 3-methyl-1,8-naphthalenediol unit and a 5-hydroxy-7-methyl-1,4-naphthoquinone unit. The hyaluronidase inhibitory activity of the isolates was evaluated, revealing that one of the triterpene derivatives possessed moderate inhibitory activity. The online version of this article (doi: 10.1007/s11418-017-1134-1) contains supplementary material, which is available to authorized users. This work was partially supported by the Japan Society for the Promotion of Science (JSPS) KAKENHI Grant Number 25460126 to K.U. We thank Philip Hawke of the University of Shizuoka Scientific English Program for proofreading the English in the manuscript.